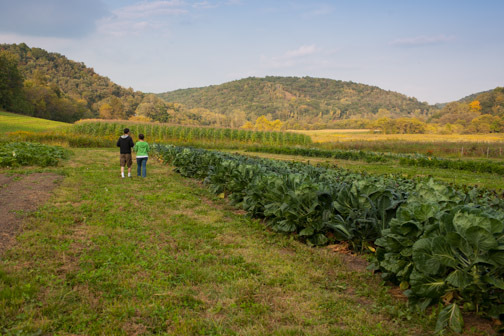 Is small-scale, local, organic, sustainable farming actually sustainable? By which I mean, can they stay in business? If you’re like me, you’ve believed up to now that surely the values that drive such small farms will carry them through; that small farms are “good”, ergo, they must inherently be able to succeed. Visiting farmer: So what keeps you in business? Weddings and special events on farms are wonderful for sure, at the very least because they are expanding awareness of the foods and farming practices they offer. But to think that, for this farm at least, staying in business as a farm means needing another revenue stream outside of what we all would consider a farm’s core business – growing food – is surprising to me. And color me as one who’s overtly ignored this reality for a while. I say this because I’ve seen a farm fail before but apparently have chosen not to make much of it. Back a few years, a much-loved dairy farm in our area had an inspection from regulators that indicated a possible problem. The agency did not prove any actual danger, but the milk was pulled from shelves. No illnesses were reported and again, there was no proof shown. In the end though, the farm could not weather the public relations fallout and shuttered. I got fairly involved with the farmer and did what I could to help him address some cash flow issues and try to get back on his feet, but it never worked. Here was a farm professing local, sustainable values and practices … but it failed. I heard recently that Tiny Greens, a small Illinois farm that had been in business for 20 years and even had strong wholesale accounts has closed as well. It was a farm professing local, sustainable values and practices … but it failed. Another business professing local, sustainable values and practices … that failed. Color me a little less naïve. Now I finally get that there is nothing about a farm with sustainable farming practices that inherently makes it “bound to succeed.” It is a business like any other (or perhaps folks will argue, tougher even) and it has to have capital, pricing, distribution and damage control ducks all in a row. (Not having an MBA, I’m sure I’m missing some items, but you get the point.) There will be bad turns of weather. There will be crop failure. There will be safety concerns that lead to publicity problems. There will be lots of bad times a farm has to weather. Just the fact that they have sustainable growing practices will not carry them through. Wanting to learn more about the business of small-farming from a farmer, we had dinner recently with my friends Jenny and Bob Borchardt of Harvest Moon Farms. Jenny runs the on-farm operations at their Viroqua, WI, farm, and Bob manages marketing and distribution matters. They define themselves as “new generation” farmers — they did not grow up as farmers but recently left professional jobs to pursue a rural, agricultural lifestyle. Jenny worked 18 years in textbook and educational technology sales and Bob ran Cuisine Populaire, a new media company focused on the food, wine and travel sector. They went through a beginning farmer training program, befriended an experienced organic farmer in their area who mentors them, and took the plunge, just as many new, young farmers around the country are doing. They are compelled to scale up so they can be delivering pallets of produce rather than boxes. They’re convinced selling large loads in the wholesale market is where the profit margin is best for them … and where they can finally earn a living wage. Of course farms of any size face struggles to stay in business. They’re impacted by weather, by government regulations, by the degree to which crop insurance helps them and of course by the marketplace — you, the consumer, and the price you’re willing to pay. Perhaps it’s just time that we the consumer realize that hanging one’s shingle out that reads, “sustainable farm” is not a free ride to monetary success. Given the consumer’s general unwillingness to pay more for foods, the case is likely the opposite. Sustainable farming may be lovely, but it is also more difficult. And it is not inherently sustainable as a business. So maybe next time you’re at the farmer’s market working on “knowing your farmer” you should ask him or her about something other than growing practices and cooking methods. I think then you’ll find that suddenly you really do know your farmer. And you’ll learn something more about the term “sustainable”. On top of producing beautiful organic produce, Jenny is a terrific cook! Dinner started with delicata squash soup followed by red wattle pork shanks and cassoulet beans from the farm’s kitchen garden. On the side were creamed curly kale and home-baked bread with Westby Creamery butter. We also scored some homebrew courtesy of their farm chef this past summer – One Hundred Meals may be developing a side theme of drawing out the homemade beers – a trend we will not argue with! This entry was posted on February 17, 2013 by Grant Kessler. It was filed under Meal Post and was tagged with Harvest Moon Farms, Sustainability. I agree Grant. When talking bout economical sustainability on farms its not about efficiency, good book work or just having a core group of customers. As a conventional farmer I often notice other conventional and organic farmers around me do things their own way. In most cases their methods would end in a catastrophe on my farm, however the methods they use have evolved over generations for what works for them and helps to keep an economical edge over other farmers in our neighborhood just as some of the weird and unique things I do on my farms help to ensure the future of my families farm. Its this diversity in agriculture that helps each farm succeed or fail as the business climate we operate in continuously adapts to consumer demands. So glad to see a new post pop up in my email! Well written Grant and helps crystallize some of the issues farms of all shapes and sizes have to deal with. I think some of us like to think of farms as idyllic places, but the reality of needing enough income to keep farming is a very real one. And I think economic sustainability has to be considered part of sustainability overall. I have friends who routinely refer to an off-farm job as supporting their farming habit. While it is a joke to some extent, there have been lots of instances where the off-farm income was the only reason the farm was able to keep going. The environmental part of sustainability is the criteria everyone agrees needs to take center stage, though some of us differ on what is classified sustainable. But the economic sustainability is critical. Especially if we want more people to return to farming and gardening. Wow. Like I always say I love this business but we still have to make money to pay the house note, tuition, and grocery bill. Another part of sustainability is having a profitable business to past on to the next generation. This takes some long term planning, but in order to secure your legacy and help other develope their legacy, it’s never too early to start thinking about this. The farmers of the present must help the farmers of the future. It takes time to pass on a lifetime of experience. Thanks Bill! And I’d expand on that with the American Indian adage about actually considering all our actions as they relate to “seven generations ahead”. This sort of thinking is difficult, but it does seem a wise mindset. Very well written and very thoughtful as well as thought provoking. One quote stood out to me, As Bob put it, “We’d just like to earn as much as our average customer.” Offhand I do not know anyone that has been in any type of agriculture that has been successful longterm where this is the case. Add to that the fact that most consumers of organic products are for the most part upper income level and I just do not see this happening for most producers. For me a huge part of my “earnings” are being independent, getting to work outdoors, and having some flexibility to my work hours and days. I never had any illusions of making what my average customer makes. At first blush, Larry, that seems like a depressing statement from you – although I am getting the sense it may well be true and necessary. In the same way that I think it is sad that we value education but underpay teachers, it seems to me we should pay farmers better for the value they bring us. You could argue on some level that education is optional to life; food is not. Is scale the answer? Low earnings expectations? High value on intangibles like you are suggesting? And what say you to this seeming paradox: Food processors, fast food joints and high-volume grocery stores have created, well, high volume outlets for farmers’ products. That seems good for farmers – high volume. At the same time, they have also created an atmosphere that says food should be cheap (call it affordable if you want). Seems like a pinch farmers are in – I’d love comments from folks on that. Is “Dollar Meal Mentality” part of the reason farmers don’t earn more than they do? If you’re a farmer reading this, of any stripe, I would love to have you speak up about your earnings expectations. Perhaps this post is a call for a little poll! I certainly did not want to sound depressing or discourage anyone from trying their hand at food production in any system (conventional, organic etc) I completely agree with you that our “systems” promote “cheap” food and it is part of the problem. I really do not know how we got to a place that people value food at such a low monetary value. I suspect that it went hand in hand with the “food security” we enjoy in this country. Your comments about education spawned another thought related to the intangibles of being in production agriculture. I have always felt that a HUGE part of my compensation was the ability to keep my children connected to nature, teach them a work ethic and spend time with each other as we do our daily work. I am fascinated by what you are doing here and excited about the conversations taking place. I am so glad I found you! Interesting that you use the term “food security” as though “we” feel cheap food = security. I agree with you that is where we are in our country, but I would like to posit that is actually pretty scary, not secure. If cheap food means we have to have farmers who, by design of the system, have to settle for extremely low earnings and accept lots of intangibles as partial compensation (you are very gracious to do so! ), I am not sure that is sustainable in the long run. And an ag system that falls apart due to anything, but low earnings in this case, is not “secure”. We do not have food security in our country if this is the basis for it. We have cheap food, but not secure food, if our farmers have to live so meagerly financially. Not arguing with you; just picking up on your comment, which I find interesting. The fact that you value intangibles the way you do is laudable. I’m impressed! But I guess I’m saying I don’t think you should have to. Or at least, not until EVERYONE in our economy also takes, say, a 30% (pick a number) cut in pay in exchange for intangibles. What I mean is, you have to function in our current economy which, bottom line, demands cash, and you have to hand over cash to pay your electric bill. You won’t get far handing intangibles over to the electric company! Grant- I am a farmer. My great grandfathers were both German immigrant farmers from russia, my grandfathers were farmers, my father is a farmer. I wanted to comment on your question about “earnings expectations”. I feel like this couple that quit their professional jobs to start farming are definitely NOT your typical farmer. Almost ALL farmers, grew up on farms. Being a farmer runs much deeper than an occupation or an income. I can guarantee you most 2nd, 3rd, 4th, 5th generation farmers don’t even think that way… that is, they don’t think about earning “as much as their customers”. It is so much more complex than that. Maybe the most concerning part about that comment, the reason we don’t think that way is because How do you make only as much as your customers when your customers are EVERYONE. Some farmers are rich/poor because they were blessed/cursed with productive/poor land. Some farmers made good business decisions, some made poor investments. Some were good stewards of their land. Some were not. Some were content to provide for a family and live a simple life, while others were ambitious and grew the scale of their business. Some fell on hard economic times, others cashed in at opportune times. I think the reason the stereotype of farmers being poor is because they are too good at what they do. Over the last 100 years, the population has boomed, yet the percentage of farmers has shrunk to 1-2% of the population, from 50% or more. As farmers became more and more productive, less and less were needed. This country has always had more food than we need. It is simple supply and demand. The supply of food is abundant, so the demand for more farmers is low. The market for food is almost always flooded, so prices for products tend to be at or below farmers costs most of any given year. Not until developing countries i.e. China starting booming and demanding more food did agriculture see a dramatic uptrend in prices and prolonged periods of profit. There are always more farmers getting snuffed out because historically profit margins are thin to non existent in 9 of every 10 years. Farming is a desirable way of life to those who understand it. Thus, we scrape by as long as we can even when “earnings expectations” are low. Conventional farmers don’t get to set prices for their products, we have come to accept low earnings in most years. This isn’t depressing to us because we are doing what we love. That doesn’t mean you can’t be successful, it’s just means that it is hard work. And hard work is not a dirty word on the farm. Another paradox that most people don’t understand about farming in the economic realm is that since prices are driven by supply and demand, that means that when supply is low due to drought for example, and demand remains high… thats right prices skyrocket, BUT remember supply was low due to drought, so farmers have less product to sell, thus limiting income. Likewise, if a particular crop or animal is highly profitable for any given reason, more farmers flock to that profitable sector, making a quick profit for that year or two, but ultimately raising production in that sector to a more comfortable supply and… thats right allowing prices to fall once again. Furthermore the reason many conventional farmers don’t see organic farming as “sustainable” is for the economic reasons. It is such a small percentage of consumer food purchases, such as niche market, that if many more farmers did make the move to organic, the market would be even more flooded with food than the conventional market, and prices would inevitably fall even further, making it less economically viable from our perspective. I would be interested to know the gross production of this farm and more specifically how many people their annual production could feed for a year. Since organic farming is typically lower yielding, how much more land would need to be farmed to produce the same amount of food as a conventional farm? Organic farming may be sustainable, but then I am not sure that our standards of living are. Likewise, if we wish to sustain our standards of living, I am not sure organic farming is economically sustainable. Not unless we are willing to pay a whole lot more for food than we do now, I mean a whole lot more than we do for organic food now. Thanks for a thoughtful, well written post. I do not mean to be snarky, but I know a lot of farmers who could have told your friends Jenny and Bob of Harvest Moon Farms that what they wanted to do is not sustainable. Most people do not want to hear what experienced farmers know. Thank you for telling the story so well. Thanks ninime for chiming in. I wouldn’t call you snarky, I’d call your comment vague. I wonder if you would elaborate for me. What part of their business would you have foreseen is not sustainable? Small? Organic? Produce? I appreciate your having experience so would love to understand your assessment of their situation (and that of other beginning farms). What does a beginning farmer’s business plan need to look like, in your view? I am not a farmer; I work with agriculture, education and nonprofit groups. In the nonprofit world, we use the word sustainability to mean the ability of an organization to continue its existence with the resources it has. In that context, it has nothing to do with the environment. I think part of sustainability is the ability to remain in business; in agriculture that has to do with efficiency and yields. That’s what I believe my farmer contacts would say. The business plan would need to include realistic expectations of yield and market value. I would just like to comment on this awesome discussion as just a viewer because this is the first time that I have found such a discussion like the one above. I am a college freshmen studying agriculture business and one of my classes has to do with agriculture public relations. In my class we were assigned a blogging project, to create our own and comment on others. This has opened my eyes to a whole new world, and I had just happened to hear about this blog, One Hundred Meals, at a state young farmers and ranchers conference this past weekend. I would just like to say that myself and the other agriculturalists in the room were blow away by your mission and by the questions you were answering for others. Thank you for taking the time to explore the world of farming and sharing it with others. I hope I don’t disrupt your conversations flow too much and I will continue to read your blog because I have already learned a lot from just this recent post. Having been around nothing but farmers since the day I was born, the “extra” job idea is not new, it’s just how I have seen farmers getting by my entire life. The joke always has been, “The best farm wife is one that works in town!” How true! Many, many farm wives work anywhere they can get health insurance. Remember that farmers are all independent business men and women, no benefits package with their employer. To help cash flow every year, my husband Daniel custom harvests for other cotton farmers. Although this is still a farming related job, it is an extra job. In his younger years, he would haul his haresting equipment down to South Texas and spend 6 to 8 weeks or more harvesting down there as well. If anyone has watched the series on TV “Farm Kings,” this same topic can be found there if you watch close enough. The farming is not what really keeps the family going. It’s the giant sacks of flour and sugar and industrial sized cans of pie filling to make the pies and pastries at their bakery that keep them cash flowing. This is definitely a topic we don’t talk about enough, at least from the consumer standpoint — I think that this is a really valuable notion to keep in mind when discussing how to feed the world. I’m all about a food system full of diversity and variety, and if the sector of ag often referred to as “sustainable” can’t sustain its operations, the food system will lose a beautiful and wonderful aspects of its diversity. I have a friend who is starting a hydroponics growing system — small scale now, but eventually he hopes for it to become his primary source of income. The indoor nature of hydroponic (and aquaponic) growing systems helps add some stability to it. This particular friend won’t have to worry about as many weather issues as your typical grower. I think as more research goes into alternative growing methods like this, we might see specialized agriculture stabilize a bit. It reduces a lot of the risk that goes with farming. It doesn’t match the romantic, pastoral image that is often associated with sustainable ag, but it would help preserve the diversity that I love so much about our food system! I’m not 100% sure if this friend is going to be raising any of his crop organically, but it’s definitely an option. atypicalaggie – Thanks so much for joining us and for your kind words! It’s a challenging project at times, but encouraging comments and the kind of thoughtful, respectful dialog we have happening here makes it all worthwhile! Which means I’m learning from people like our friend Suzie – I take your informal survey of farmers and their extra jobs as valuable info! So a follow-up question for you (and anyone who wants to comment). Is scale not the silver bullet people think it is? Do you see farmers who scale up and are able to move then away from the “extra job” scenario? Kelly, hydroponics is all the rage here in Chicago as well. Not sure where your friend is, but it is interesting because of its insulation from weather and climate, but also because it can happen easily in dense urban areas! Grant, my friend is actually at the southern edge of the greater Chicagoland area. He’s based just outside of Kankakee. Actually Grant, the largest producers in the area who are two brothers and their three sons are also the largest custom contractors in the area too. They custom plant and custom harvest more acres than any other custom operators in the area. So, no, large scale does not allow most farmers to move away from extra jobs, it seems to require more due to the cost and maintance of the large equipment. I thought last night of many of the extra jobs that my larger clients have: caterer, sauage shop, veternarian, welder, metal building construction, service manager of an auto dealership, postmaster, show pig breeder, show steer breeder, trucking company, custom chemical applicator, building foundation company, grain elevator business, crop & pest consultant, …These are jobs of some of the largest clients that I have, in otherwords, these farmers farm what you would consider large acres. Scaling up is not the silver bullet. Hey Grant, My viewpoint on scale has changed drastically over the past 15 years. I used to believe that the answer was get big, specialize or get out. However I think that getting big is going to be more of a drawback than an advantage in the future as it comes with more overhead and paperwork. Instead as I alluded to in my previous comment each farm has to determine what is the best use of their resources and tailor their operations for that specialty. In some cases that may still be size, but in my opinion the emphasis wont be as much of an advantage as it used to be. Spell check was not working! So glad to see to this being discussed, and it’s so true that we don’t think about sustainability as it relates to the business side of farming often enough. When I explain to people that I graduated from college with no debt, I often say it’s largely because my parents are dairy farmers and everyone understands. In high school I sometimes got very frustrated over the fact that an occupation that makes food for the rest of us has such a hard time earning a decent living – it still frustrates me, but I’m a bit more level-headed about it now. Thanks Anna! And, um, if you’ll pardon me being a little thick, could you clarify for me how being the daughter of dairy farmers means you, of course, had no college debt? Because their low income meant you got scholarship monies? Sorry, just trying to be sure I understand that. So I guess One Hundred Meals is only seven? I’ve been keeping up with this blog since early this year and there have been no updates since February. This is a real disappointment. This blog really had potential.